There are many women that dream of finding and settling down with a rich man. This is because they can look forward to increased financial stability and the chance to be spoilt and looked after. Of course, depending on the circles that you mix in, there is a chance that you won't come across truly wealthy men very often and this could definitely hamper your efforts to meet and get into a relationship with a rich man. One thing you can do is work out the best places to meet rich men. There are a number of options available when it comes to meeting rich men who are single and may be looking for a relationship. By making sure you frequent the right places, you can increase the chances of finding something who is rich and who you find attractive. 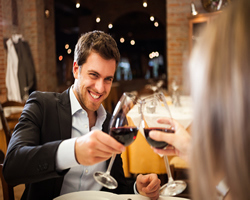 Going to up-market places: If you have the finances to do so, going to up-market restaurants and bars could be a great place to meet a rich man. Many rich men don't have a huge amount of time to socialize but when they do they tend to go to places that are trendy, classy, and elegant. Posh wine bars and fancy restaurants are amongst these places. Another great option is a large casino where many rich men go to let off some steam. Heading to corporate events: You can also head to corporate events in order to meet rich men, as many will be at these places for business reasons. If you do intend to do this, make sure you dress the part and look business-like otherwise you will simply look out of place. Also, take an interest in what you see at these shows and events otherwise you will simply look lost. Rich dating sites: One of the easiest ways to meet a rich man is to join a specialist rich dating site. You will find sites that are filled with rich men who are looking for a relationship. When you go onto a reputable site, you won't have to worry about any scams because the rich men that join the site are verified in terms of their wealth. This is a great way to get talking to rich men without feeling intimidated. You can then get to know the men you are interested in online before you actually make arrangements to meet up. These are just some of the places where you can go if you want to meet rich men. If and when you do arrange to meet up with a rich man, you should remember the importance of elegance and etiquette. Do you research first, make sure you dress the part, and take some time to think about what you will talk about, as this can all help your cause.